There are two main types of dog walking – dog walking that's fun and dog walking that's just a nightmare. As a dog owner, you've probably experienced both of them, and while right now you may be experiencing the fun of dog walking, that could soon change. Luckily, there are a number of dog walking aids that can be used which really can make dog walking once again fun and enjoyable. Looking at the various dog walking aids out there, there are so many choices. If your dog seems to be pulling at the lead, then there are alternatives to choosing a collar. Indeed, often the best alternative is what's known as a gentle leader. This is effectively a harness that goes around the dog's nose which is a harmless and painless way to keep him walking correctly. There are numerous dog walking aids out there, and they are for your benefit as well as the dogs. One such example is the extendable lead which is a great idea as it lets your dog wander when you permit it, and you can soon reel him back and have him under control in no time. However, one of the most effective dog walking aids is not a special lead, special collar or even some magical dog walking tool, it's simply your voice. You'd be amazed at how many people don't actively communicate with their dog. The fact is when you are out with your dog; he'll be watching you and listening to you, as you're the one he knows. Keep him rewarded when he behaves, and scold him when he's naughty. Rewards come in the form of dog treats of course, and as any dog lover will tell you they are the best dog walking aids available. They're also the most affordable as you can even make them yourself! 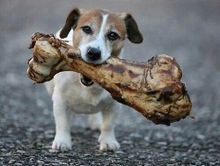 Bits of chicken, dog biscuits make for great rewards, but if you're buying ‘special' dog treats, check to see what they're made of, because many of them are as fattening as human ones! Today there's a huge market for dog walking aids and while many of them may make your life easier, the fact is they're often designed to make profit for the inventors first! Indeed, some of the best dog walking aids are the simplest, and when looking at ways to make your dog walking life easier, the best thing to do is to speak to your vet and find out what he recommends. By speaking to your vet, you'll probably find that he discounts a lot of the ‘gadgets' as junk whist at the same time recommending some products that really do work. The golden rule is to listen to your vet, because while many dog walking aids are designed based on good principles, the fact is that they may make things even more difficult. Ultimately, you may find that all you need are a few valuable tips from a dog expert and before you know it you'll be enjoying dog walking once again.